"I ONLY LOOK AT PEOPLE THROUGH THE SIDE." Very prevalent in anime, whenever a person's opponent gets behind them, instead of turning around, their eyes will snap sideways. As anyone with any common sense will tell you, it doesn't work. However, it just looks so much cooler this way. This is often accompanied by a close up of the person's face, or even the outside eye. There is also a calmer version used to demonstrate the fact that the observant character is well aware that the spy or stowaway is there. Yet another variation is used when the character is talking to someone with his/her back turned to them. If this happens, pay attention to what was just said, because it's probably important. Not that you can tell from behind. Truth in Television, though: if you hear something behind you, your eyes will often reflexively flick towards the direction of the ear closest to the sound, even if you don't turn your head to look. This trope is almost never played for comedy. If it's the Aside Glance, then it's not this. Compare Look Behind You. Naruto is fairly fond of this. It happens multiple times in Gaara's fight with Rock Lee, after Lee removes his training weights. Bleach uses this fairly often. Justified, considering all the Teleport Spam that goes on in that show. If a fight scene with Ichigo goes by without one of these, then something is seriously wrong. Well, either that, or he's in for a Curb-Stomp Battle. Raditz does this when Idiot Hero Goku manages to grab his tail. Hell, Dragon Ball Z lives off of this trope. Gohan does this when Videl starts following him. 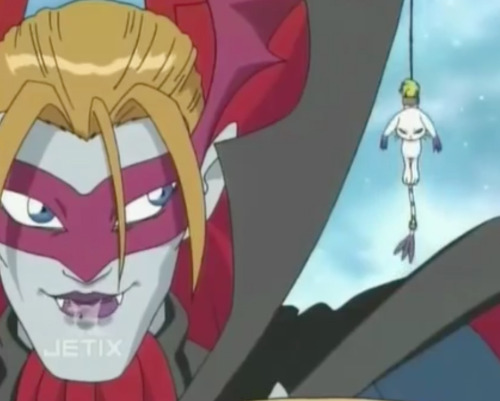 Zoisite seems fond of turning up behind Nephrite in The '90s Sailor Moon Anime, usually to spy on him and earn a sideways death glare when she announces her presence. 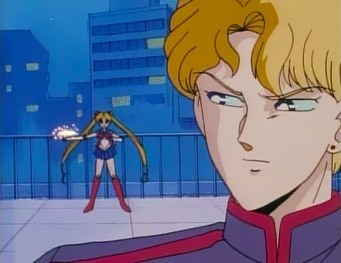 Our page image is Jadeite doing this to Sailor Moon in Episode 3. This comes up often in the Fate/stay night Fate anime. Archer will not usually face Shirou when talking to him. A very definitely non-comedic example happens in Fate/Zero when Kirei betrays Tohsaka by stabbing him with the Azoth Dagger. In Soul Eater Eruka Frog pairs this with Oh, Crap! after realizing that 1) Black*Star has survived her barrage of bombs and 2) He's very, veeery angry about it. In Gamaran, the deadly martial artist of the Muhou School Kiyomori Yamanoue barely looks at Kashitarou when he arrives behind him, asking who's there. In this case, this is likely motivated by Kiyomori's massive hubris. 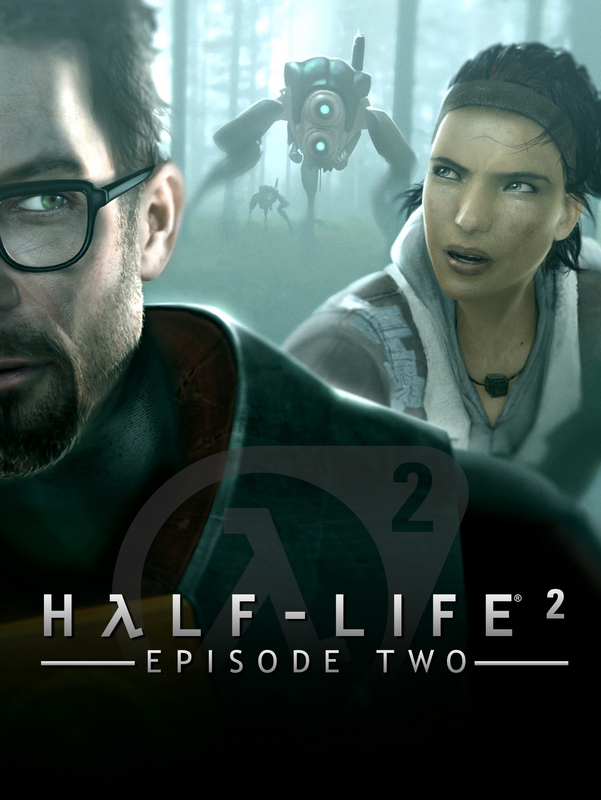 On the cover ◊ of Half-Life 2: Episode Two, there is a pair of Hunters sneaking up on Gordon and Alyx. They seem to be aware of their presence, but are looking to the side instead of behind them. Alyx's head is slightly turned towards the Hunters, so it's possible that she can just barely make out the closest one peripherally. No such luck for Gordon, though. If anything, his head is turned slightly away, and his eyes aren't even nearly as far to the side as they could be; so it really just seems like he's looking at someone who's in front of him and 45 degrees to his left. In Shin Megami Tensei III: Nocturne, the Demifiend does this when he fights Dante in the Labyrinth of Amala. This occurs several times in the cutscenes of the Ninja Gaiden NES Trilogy.